This section offers wildlife viewing highlights along the Alaska State Marine Highway's Southwestern route with the exception of the Pribilof Islands, which are only accessible by commercial air service. The ferry route provides regular public transportation from April through October for eight remote Alaska Peninsula and Aleutian Islands communities, from Chignik to Unalaska, with additional stops in Homer, Kodiak and Port Lions. For residents, the twice-monthly ferry trips, serviced by the ferry M/V Tustumena, offer opportunities for taking care of necessities such as transporting vehicles and gear, grocery shopping or medical care. For wildlife watchers, the journey can be an experience of a lifetime, with opportunities to view little-seen animals amid dramatic natural backdrops. Birders come here from around the world to add unique species to their "life lists." No spur-of-the-moment jaunt, this nearly 2,000-mile trip takes at least six days, and tickets cost about as much as cross-country plane fare. Because the Tustumena runs infrequently, and accommodations along the way are few, anything beyond a brief stop in most communities involves careful advance planning. Because the Aleutian Chain trip passes along a significant slice of the remote and widespread Alaska Maritime Wildlife Refuge, a refuge naturalist rides the state ferry from Homer to Kodiak and Unalaska in the summer to present educational programs and answer questions. Refuge experts suggest visiting June through August, when marine birds and mammals are coming ashore to breed and raise young. Fall visitors could be in for stormier seas, but will see a variety of arriving, over-wintering birds. Early spring is the best time to catch whale migrations through Shelikof Strait. The Pribilof Islands, which lie 200 miles north of Unalaska in the middle of the Bering Sea, are popular with birdwatchers. 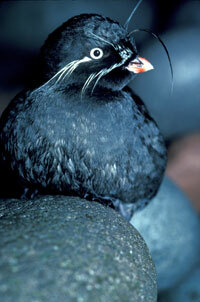 Over 240 species of birds have been identified there; an estimated two million seabirds nest there annually.